Our next Rock ‘n’ Roll weekender is at Warner’s Norton Grange on the Isle of Wight. Norton Grange is one of our favourite venues for it’s fabulous location overlooking the sea, the great food and the friendly helpful team. Isle of Wight is always a joy and Yarmouth is a pretty little town in walking distance. Warner’s are known for their excellent food and the location has great views over the Solent. We also have a fabulous line-up with ‘Whole Lot of Shakin” star Rebel Dean & The Star Cats, the very entertaining and talented Joey & The Jivers, the superb vocals of Shane Baxendale with his all-rocking band The Korrados, the ever-popular Greggi G & His Crazy Gang and the superb talent of Jim Hammond on keys and vocals and Bill (of Kingcats fame) on drums and vocals, together known as the Sweet Georgia Boys. Click here for the programme. Add to that our DJ Dynamite Dave and dance classes with Steve & Tara of Jive Revive, and you have a weekend you really shouldn’t miss! To book, visit Warner’s website or call the booking line on 0330 100 9774. We’re looking forward to another year of fabulous gigs and festivals with stellar performances from our regular bands as well as exciting new bands! Our first gig of 2019 is with the fabulous Gary Fletcher Band at Farnham Maltings in the Cellar Bar on Thursday 17th January. For those who don’t know it, the full address is Bridge Square, Farnham GU9 7QR and there is ample free parking as well as plentiful local bars and restaurants. The Maltings is also close to Farnham Train Station if you want to let the train take the strain! 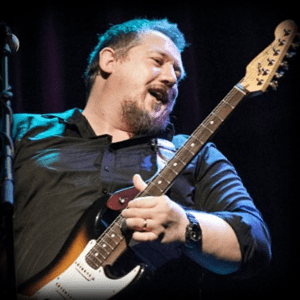 A founder and ever present member of The Blues Band, Gary Fletcher has appeared with and/or recorded with Peter Green, Maggie Bell, Van Morrison,Long John Baldry and more. 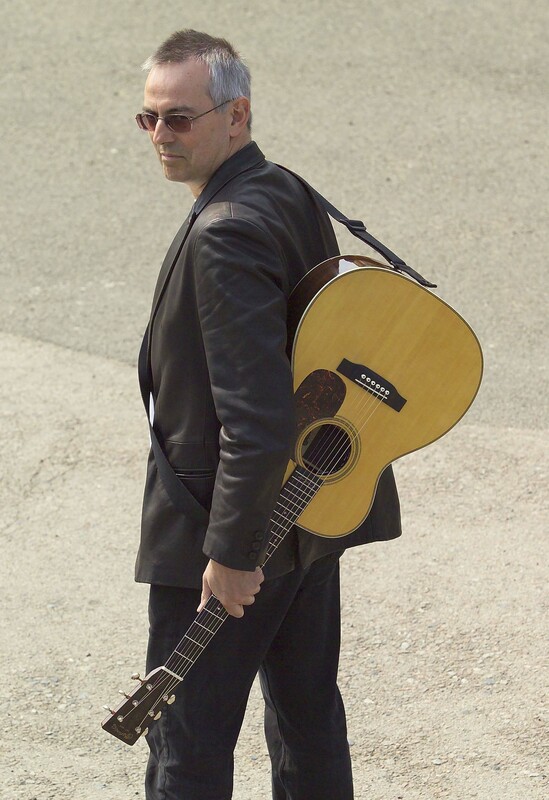 Gary plays and sings a compelling mix of originals and classic covers, incorporating elements of blues and Americana using guitar, slide, banjo, mandolin and ukulele. When not working solo he showcases some exceptional musicians. At the Maltings, the stellar line-up is Gary Fletcher (guitar, vocals), harmonica player Alan Glen (The Yardbirds, Nine Below Zero etc) , violin virtuoso Tom Leary (Lindisfarne, Feast of Fiddles), drummer Sam Kelly (Dave Kelly Band, Tom Robinson etc), ace guitarist Nick Ritchie (Mud) and last but not least Andy Billups (The Hamsters). This will be a great show! Tickets £14 on the door (cash only please). Ticket reservations recommended. Doors open 8.15 pm for a 9.00 pm start. For full details of this and other blues gigs, please visit our Blues gigs page – click here. Our next Blues Weekend is at The Heathlands in Bournemouth 7th to 10th December 2018. We have a fabulous line-up and there’s always a great vibe as well as fabulous sound quality. We have a brilliant line-up headlined by fabulous singer, songwriter and guitarist Marcus Malone, who has now teamed up with killer guitarist Innes Sibun. A great combination! Also playing, the wonderful Giles Hedley with his Aviators, fabulous blues harmonica player and singer Stevie Smith and his superb band, guitar supremo Guy Tortora, Guitar Heroes finalist Steve Morrison and Blues Abuse featuring Alan Glen on blues harmonica, plus wonderful guitarist Vince Lee with fab blues songstress Becca Langsford, and late night jam sessions with Blues Situation. A great line-up! Also fabulous value at just £209 per person for three nights half board. The hotel is one of our favourites for it’s friendly and helpful attitude and the great atmosphere. Plus we have ‘Happy Hour’ every day, and bacon butties at midnight! In addition to the late night jam sessions, we also have an ‘open mic’ area so that you can have an informal jam or practice during the day. And a blues cinema. Tremendous fun as well as being a brilliant music weekend! Click here to see the full leaflet. Click here for the booking form. We still have rooms available, so please help spread the word! 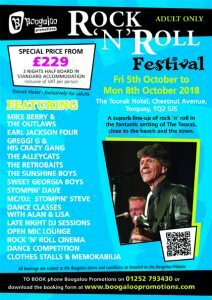 We’ve put together an all-action programme for our first Rock ‘n’ Roll Festival at the Toorak in Torquay running from 5th to 8th October 2018. The programme includes dance classes as well as all the bands, plus a Rock ‘n’ Roll Cinema, the Boogaloo Ramble, an Open Mic Lounge and late night DJ sessions. Mike Berry headlines – with over 40 years in the music business, the ‘British Buddy Holly’ still has one of the finest voices on the rock ‘n’ roll scene today. Also playing, the Earl Jackson Four, The Alleycats, Greggi G & His Crazy Gang, The Retrobaits , The Sunshine Boys, the Sweet Georgia Boys and Earl Jackson & Stompin Dave rock ‘n’ roll duo. Day tickets are available at £25 each from 10.30 am until midnight. Evening tickets are available at £20 each from 8.00 pm until midnight. You can buy these at the venue. For enquiries contact Boogaloo via info@boogaloopromotions.com. For last-minute room bookings, contact Boogaloo via info@boogaloopromotions.com or contact The Toorak on 01893 400500 and they will contact one of the Boogaloo team. We’ve got a fabulous line-up for our next Blues Weekend at The Toorak in Torquay 14th – 17th June 2019. The leaflets will be available SOON, but this is a ‘heads up’ as this weekend always sells out, based on a winning combination of great music and a fabulous hotel! Blues Situation will be kicking the weekend off on Friday 14th June with ‘Happy Hour’. We’re delighted to have stunning guitarist and singer Stevie Nimmo with his band, plus Elles Bailey, Greg Coulson Band, Tom C Walker Band, Yoka & The Sugarbeats and the Eddie Angel Blues Band. We will also have an Open Mic Lounge, a Blues Cinema, afternoon acoustic sessions and late night jam sessions led by Blues Situation. Plus MC Earl Jackson. We’re already one third full, so don’t leave it too late to book! Contact us at info@boogaloopromotions.com or ring us on 01252 793430. Rooms start at £239 per person including three course dinner and full-on breakfast. Fantastic value for this quality weekend! Our next weekender is at the fabulous Toorak Hotel in Torquay from October 5th – 8th. We love The Toorak for lots of reasons. It’s a great hotel, the food is fabulous, the staff are wonderful and the facilities and location are excellent! Add to that a great line-up at a value price, and you have a weekend not to be missed! At the time of writing, we still have double and twin rooms available, so why not give us a call or go online and get booked! You can contact us at info@boogaloopromotions.com, ‘phone us on 01252 793430 or go to our Rock ‘n’ Roll page where you’ll find full details, a booking form and payment links for the deposit. Boogaloo Promotions is based in Farnham, Surrey and is run by Monica Madgwick and her team of music enthusiasts. Boogaloo run regular blues and boogie gigs at Farnham Maltings, as well as blues, rock 'n' roll and jump jive weekenders and gigs, with the emphasis on quality and FUN! Boogaloo also run a booking agency to provide top quality bands or artists to individuals and organisations.